Who could ever be more familiar with cooking odors than a Filipino household? 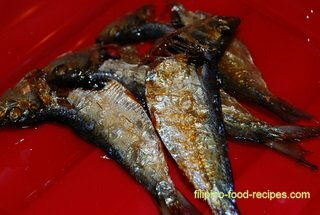 We cook a lot of fish dishes - and what could ever be stinkier than frying Tuyo? Also, the sauces that we cook with are just as stinky : fish sauce, fish and shrimp paste and vinegar. So, you could either build a 'dirty' or a second kitchen outside your house, but the downside is that neighbors might complain with stink coming to them. Or, you also could just buy pre-fried Fish or pre-cooked meals, but it's never the same if you freshly cooked them yourself, right? When building an outdoor kitchen or staying away from all these foods and sauces are not options for you, we better explore other ways on how to remove cooking odors. Naturally, you tend to just open all vents and windows, or turn the fan on to disperse the bad air around. Cleaning the cooktop, walls, floors with strong cleaning chemicals? Nothing beats a clean kitchen, but the smell of chemicals is bad for you. Spraying the air with Glade® or Febreze®? Masking with fresheners could work for light odors. Lighting a scented candle? Again, for light odors and could last only while the candle is lit. Brewing coffee? Unless you love the smell of freshly brewed coffee or doesn't mind drinking it quite late at night right around when you are cleaning up the kitchen, this could work for you. You could also leave the grinds out to infuse more brewed coffee smell in the air. What really works for me? How about toasting bread until blackened and burnt? I know, you're saying it's the first time you're hearing or reading about this technique! The smell of burnt bread will linger on the air for 5 - 10 minutes, and by the time the scorched smell is gone, the funky cooking odor will be gone as well. Toast the bread a bit at a time until it has blackened or emitting burnt odor. It could produce some smoke so be extra careful. You could use any kind of bread that is not oily. Oily or buttery breads like croissants can fire up and can be very dangerous. I usually use Cinnamon Raisin and Blueberry bagels, because they have such a sweet, fruity smell to them. (NOTE : I give credit to my sister-in-law Ma. Khristine Pineda for this burnt-bread-odor-remover procedure. She was the one who taught me this and it certainly works well for me). PRECAUTION : The last part of this page regarding toasting bread until burnt is NO CHILD'S PLAY. Take all the precautionary measures you need should you decide to follow that suggestion because there could be smoke in the process or the bread could catch fire. Please read the Legal Disclaimer page on this website.